I adore spinach artichoke dip. Seriously, I'm a big fan. My best friend, Alex, can claim credit for my love since she sort of forced it upon me. We used to go to TGI Friday's and she would insist that we share the spinach artichoke dip, even if I told her I wasn't a fan. She said, "No. You like it and will share with me." And I did like it, and I did share it with her. BUT I do not like to eat it with tortilla chips-I need some sort of bread or flatbread or some such to dip in it, or I'm just not about that life. 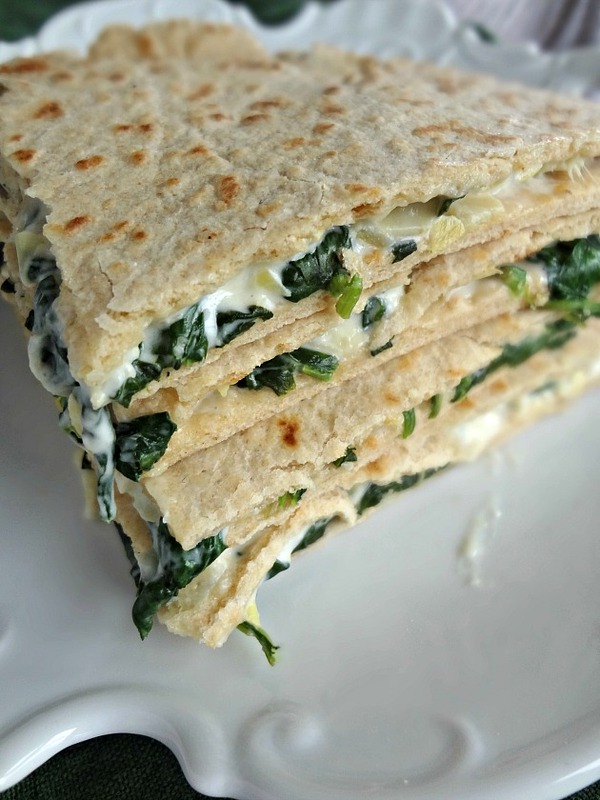 Which is the beautiful thing about these quesadillas--you can skip the whole step of dipping. 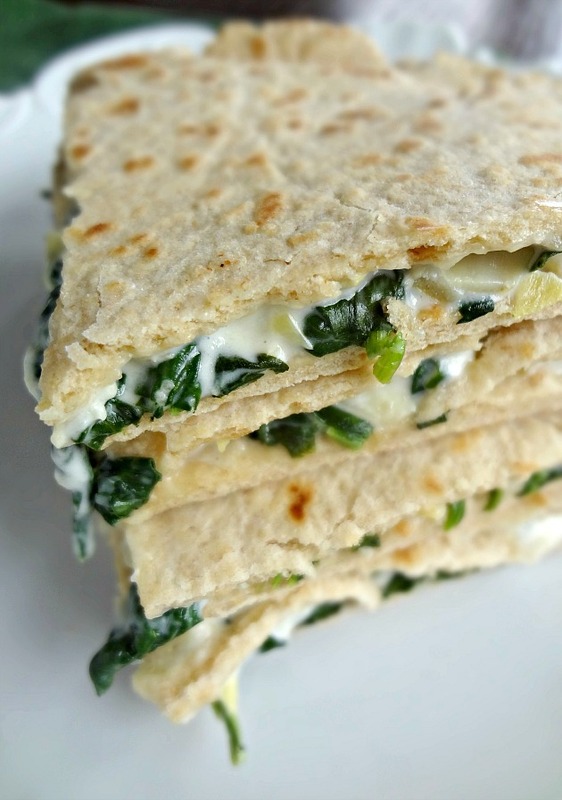 The spinach artichoke yumminess is sandwiched between 2 tortillas and it's all warm and cheesy and tortilla-y and I am a BIG FAN. The spinach and artichoke dip is super creamy and rich, and comes together on the stove crazy quickly. Then it's just about spreading some on a tortilla, topping with another tortilla, and heating in a skillet until everything is warm and crisp and happy-wonderful. Michael and I both give our seal of approval! 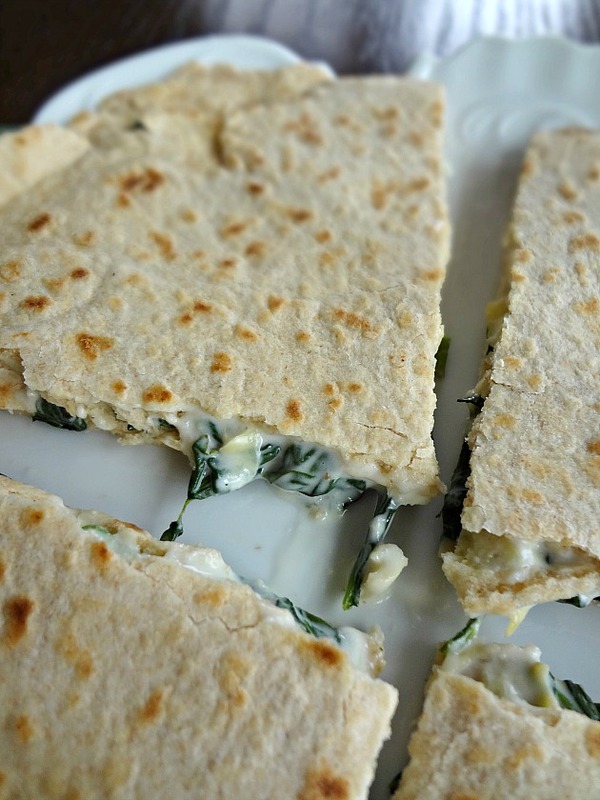 Makes 4 quesadillas (recipe can be easily halved). In a large skillet, heat each tortilla on each side for about 60 seconds. In a large pot, heat oil over medium-high heat. Add in the chopped artichoke hearts and cook for a minute. 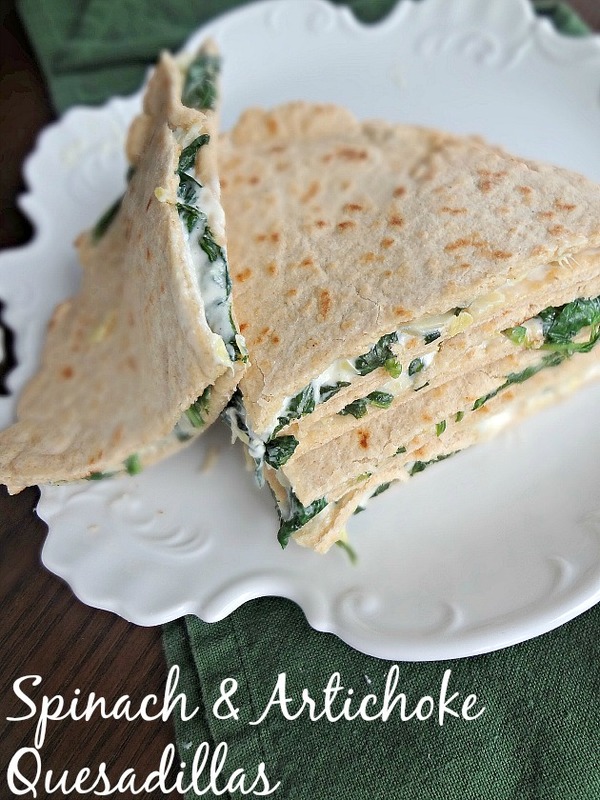 Reduce heat to medium, add in the spinach, and cook-stirring often-until wilted. Mix in the cream cheese and mozzarella and Parmesan cheeses, and let it melt entirely, stirring constantly. Season with salt and pepper to taste. Remove from heat. 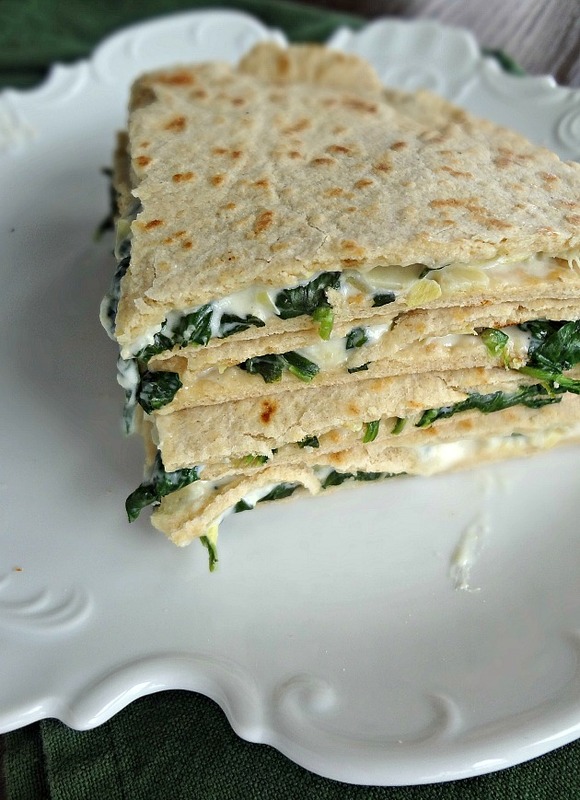 Divide the spinach-artichoke mixture evenly between 4 tortillas (approx. 1/4 cup per tortilla), then top with remaining tortillas. Heat a large skillet over medium heat, add each quesadilla and heat for 1-2 minutes per side, until crisp (be careful not to burn). Remove from skillet and repeat for each quesadilla. How lazy does this make me, that I've cut out the step of dipping into the dip?